SIDE EFFECTS reads as one half New York Review of Books essay on the insidious pharmaceuticals industry and one half John Grisham knock-off. Both halves sit uneasily alongside each other, and while well-enough done, never quite cohere. Moreover, they aren't satisfying in the conventional sense. To my mind, the first half of the film is by far the strongest. The NYRB lecture on the complicity of Wall Street, psychiatrists and Big Pharma is elegant and concise. What's unnverving for a British audience, where medications is, if perhaps less common, certainly less overt, is how little surprise everyone evinces when the protagonist, Emily (Rooney Mara) tries to commit suicide. As she returns to work and socialising with her ex-convict financier husband (Channing Tatum), everyone she comes into contact with has their own use of anti-depressants to relate. There is no sense of enquiry. It's taken for granted that everyone has periods where they need medication - whether for depression or just a sharpener before a job interview. Of course, the first half of the film isn't really a film in a conventional sense. There's no sense of drama - no tension. Emily's family and friends are so understanding that it turns into a pharma-procedural - we are literally just being educated on what it is to be within modern psychiatry. The second half of the film is far less satisfying. It plays as a kind of sub John Grisham thriller in which a wronged man is reduced to nothing and then, with nothing but self-belief and his own intelligence, double-crosses all those who did him wrong. Jude Law, as Emily's pyschiatrist Dr Banks, is thus the avatar of Michael Douglas, using and abusing his ability to institutionalise and medicate his opponent. This part of the film works as a finely tuned clockwork toy. You know precisely what the outcome is - it follows its genre conventions precisely. There's no tension - no surprise. I found myself marvelling at the interior design of Jude Law's apartment and the shockingly trashy ombre hair colour on Rooney Mara's hair extensions. So here's the deal, you can watch SIDE EFFECTS and have an okay time learning about stuff you already know and watching a thriller where every plot twist is expected. The performances are good enough, and the soundtrack by Thomas Newman is particularly good. But let's not kid ourselves that this is a work of art. SIDE EFFECTS has a running time of 106 minutes and is rated R in the USA. 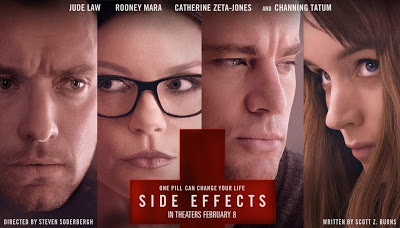 SIDE EFFECTS was released earlier this year in the USA, Canada, Romania, Australia, Russia, the Ukraine and Lithuania. It is currently on release in Greece, Portugal, Ireland and the UK. It opens next weekend in the Czech Republic, Hong Kong, Kuwait and the Netherlands; on March 21st in Argentina, Singapore and Mexico; on March 28th in Chile, Estonia and Latvia; on April 3rd in France; on April 10th in Belgium; on April 19th in Poland and Sweden; on April 25th in Germany; on May 2nd in Denmark; on May 9th in New Zealand and on May 31st in Brazil.